With the most extensive diamond line in the industry, Brasseler Canada offers a variety of laboratory diamonds available from our Genuine Peter Brasseler Series™ Line of Diamond Instruments. The market leader in this category, Brasseler Canada's laboratory diamonds are designed with key opinion leaders and innovations to provide the perfect balance between cutting efficiency, smoothness and longevity. 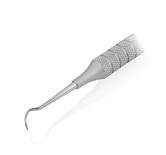 This category includes a comprehensive line of grits and shapes for adjusting, shaping, contouring and finishing acrylics, composites and ceramics that meet the needs of the dental office and dental technician.